Lucky Joe faced a German line holding 2 objectives who nearly doubled the number of his men… however half of the Germans were not on the field yet and had been delayed arriving in time for the skirmish. Joe decided to take a huge risk and run his men up both flanks, weathering mortars and lead alike to take the objectives from the blasted Huns before they knew what hit ’em. The Gambled paid off. Joe’s men ran faster than most men at the urging of their commander all the while minimizing casualties and keeping steadfast on their target so as not to be pinned and slowed down. By the time the German reinforcements arrived, it was too late. 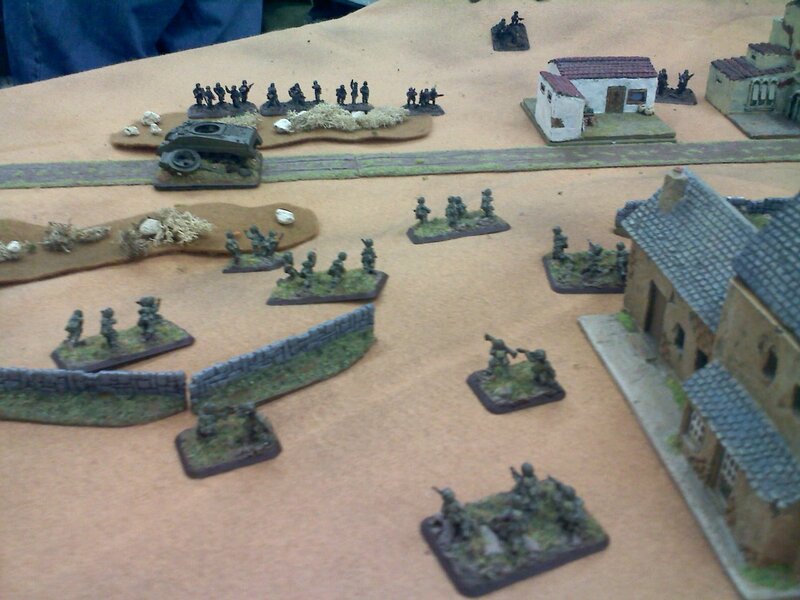 Lucky Joe’s 82nd had pushed the Huns off the objectives and Hans, the Germans’ CO, desperately attempted to counterattack (played by Luke), and push the Yanks back off the objevtives. 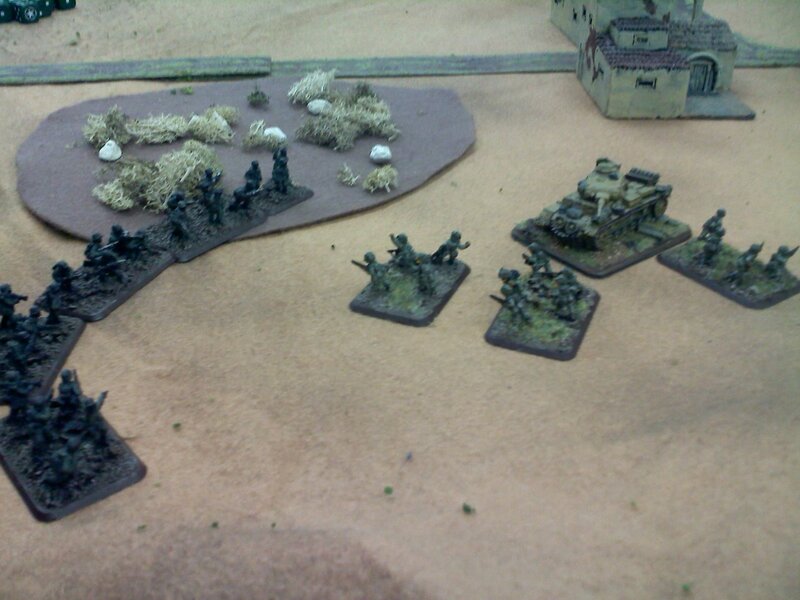 Here Lucky Joe’s 82nd set up a hasty defense against the oncoming German counterattack. But the counterattack is too little too late. The 82nd hold the line. On the opposite flank, Lucky Joe directs his men to hold the other objective and send the remaining of the bastdard Huns into oblivion. Lucky Joe pushed the Germans back and won the day. Overall – a very fun game, and well fought on the part of my opponent, Luke. This was actually my first victory in the campaign so far, and I finally feel like I am getting the hang of how to use the airborne more effectively. I look forward to playing again on June 9th. Go 82nd! Yes, Hanz Schmidt suffered his first lose to the infamous 82nd Airborne. His tactics to rush me before I could reinforce made all the difference. My infantry ace also failed to call in his off battlefield mortar support, using “I need mortar support!”. Alas, the victory goes to the allies…. …. this time. 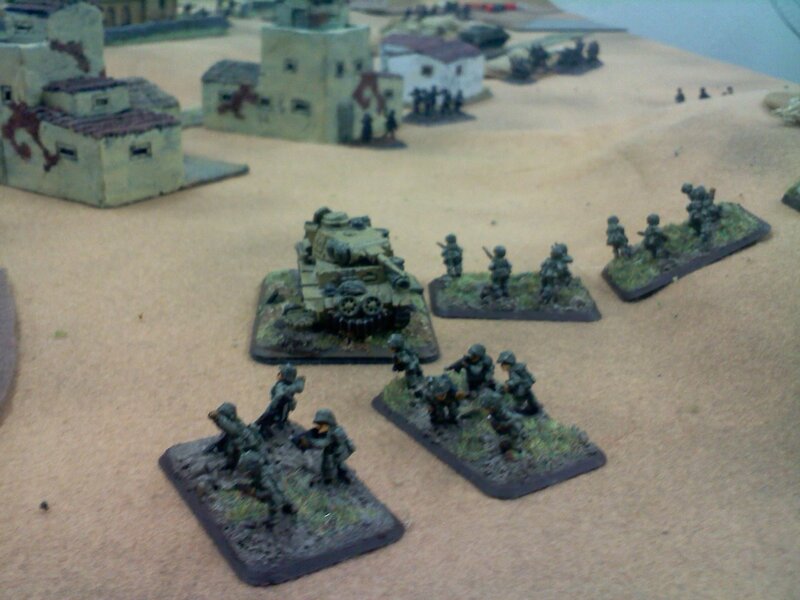 Our next game night for Operation Bagration will be on Saturday, March 2nd 3-8pm at The Panzer Depot. Games are at 1500-2000 points. Please email me at doylema4@gmail and let me know if you are interested and/or planning on attending our next gaming session for Operation Bagration. You could see your name here too! Come join us on our next gameday!